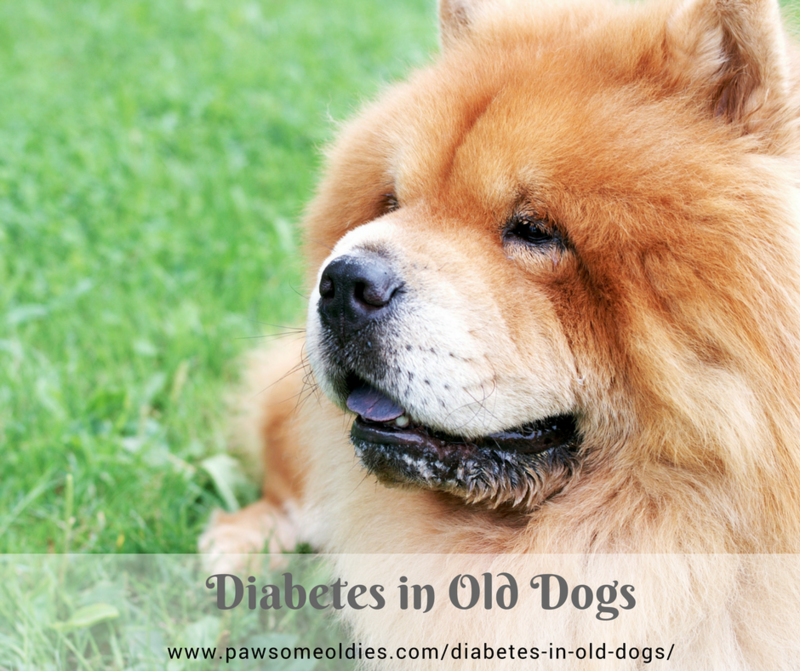 Diabetes in old dogs is rather common. Is your older dog drinking a lot more water recently, and having to go pee-pee more frequently? Has she started losing weight even though she seems to be hungry and wanting food all the time? If so, your dog may have diabetes. In dogs, diabetes is mostly caused by the pancreas not being able to produce insulin (Type I diabetes). More and more research shows that Type I diabetes is the result of some form of autoimmune disorder. What this means is, the immune system is mistaking certain organ in the body as “foreign”, and attacks it. When the dog’s immune system attacks the pancreas, causing it unable to produce insulin, Type I diabetes occurs. Type I diabetes was formerly called “juvenile diabetes”. But, in dogs, this type of diabetes is adult onset. 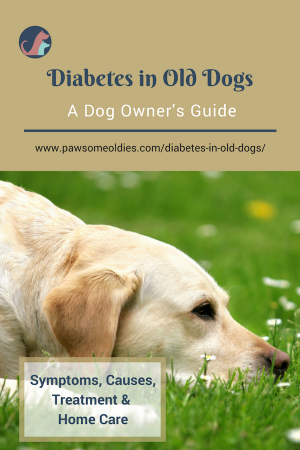 Is Diabetes Common in Older Dogs? Diabetes is one of the most common endocrine diseases. It affects about one in every 160 dogs. Most dogs that are affected are middle-aged and older – diabetes commonly affects dogs at 7 to 9 years old. Some other dogs are also at higher risk of developing diabetes. For example, diabetes is more common in females and neutered males. Dogs who have pancreatic issues such as chronic pancreatitis are also at risk. So are those suffering from Cushing’s disease. Obesity is a risk factor for pancreatitis. Since pancreatitis can lead to diabetes, there is an indirect link between obesity and diabetes. Species inappropriate diet can also cause diabetes in dogs. A diet low in good-quality protein sources, high in grains and carbohydrates can result in diabetes down the road. Dogs not having enough regular rigorous exercise tend to become obese, and obesity is linked indirectly to diabetes. So… drag your older dog out every day! It is important to do some rigorous aerobic-type exercise for 30 minutes or so to maintain her body weight and muscle mass. Many holistic vets are of the opinion that over-vaccination causes various health issues, including diabetes. Why? Because vaccines can weaken the immune system, making it easy for autoimmune disorders to occur. If your dog is showing these symptoms, take her to the vet immediately for a checkup. Dogs with diabetes are prone to urinary tract infections. Because the sugar level in the urine is high, it is easy for bacteria to grow in the bladder and urinary tract. Diabetes also makes it easy for dogs to have oral issues such as gum infections. Another common problem arising from canine diabetes is diabetic cataracts, which can cause blindness if left untreated. The majority of dogs with diabetes commonly develop cataracts within 6 months of diagnosis. And 80% of diabetic dogs have cataracts within 16 months of diagnosis. Diabetic dogs can also develop kidney problems, such as kidney failure. The sugar in the urine can cause damage to the kidneys and, over time, kidney problems arise. Liver disease is another health problem associated with diabetes in dogs. Diabetes can alter fat metabolism, resulting in fat accumulation in the liver. For proper treatment, early diagnosis is essential, so if your old dog shows some of the symptoms above, don’t delay – take her to the vet immediately. There is no cure for diabetes and insulin therapy is necessary to control blood sugar levels in a diabetic dog. Even holistic vets find that twice-daily insulin injections are absolutely necessary. They may also recommend some natural herbs or supplements as complementary remedies. Bear in mind that such natural remedies ALONE are not enough to treat diabetes. Also, never try to use any remedies to treat your diabetic dog without consultation with your vet. 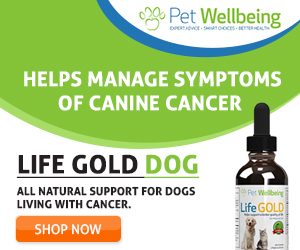 I have come across a site on old dog health that recommends “a natural and effective alternative” treatment for diabetes. It’s an herbal formula and, while it might help if used in conjunction with insulin, it can NEVER be an alternative. 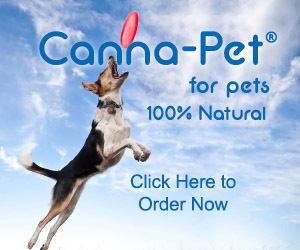 Treating diabetes in dogs is not as simple as taking some herbal pills. It can be complicated. It involves insulin injections, constant monitoring of blood sugar levels and adjusting the diet accordingly. What Does Insulin Treatment Involve? Usually insulin is injected twice a day, immediately before or after a meal. There are different types of insulin products, and your vet will recommend one that is suitable for your dog. Proper injection is also important so be sure to ask the vet to show you how to do it correctly. Immediately after diagnosis and at the start of the treatment, you most likely have to take your dog to the vets every 1-2 weeks for tests. These tests include blood test, urinalysis, and physical exam so as to monitor the blood sugar levels and adjustment of insulin dosage and/or diet. Once the blood sugar level has stabilized, vet visits can be cut down to once every 3 to 6 months. As mentioned above, diabetic dogs tend to develop gum disease, so to help prevent tartar buildup, daily brushing can be very helpful. Herbs and supplements can be used to help strengthen the immune system, and to prevent some of the health issues that diabetic dogs are susceptible to. For example, to prevent UTIs, cranberry extract and probiotics can be used. To support the liver, milk thistle and choline are effective. Fish oil (such as salmon oil), with its rich Omega-3 fatty acids, may help reduce the oxidative damage and inflammation that commonly occurs in dogs with diabetes. To improve kidney efficiency, the herb ginkgo is recommended. Aloe vera, fenugreek seeks, and cinnamon have been found to lower blood sugar levels and stimulate insulin production. Be sure to talk to your vet first if you want to supplement your dog with some of these supplements. Amitraz is an active ingredient in some flea/tick products (such as Preventic collars, Certifect), as well as in a product called Mitaban that is used for treatment of mange caused by the mite, Demodex canis. The ingredient Amitraz may cause blood sugar levels to increase, so do not use the above products if your dog has diabetes. Diabetes requires life-long treatment and care, so it is quite natural to feel overwhelmed if your senior dog has been diagnosed. But, by working together with your vet, it is totally manageable, and many dogs with diabetes can live a happy, long and relatively healthy life.